Although the following article was written after the severe winter of 2014, the same considerations apply after every winter in our region. 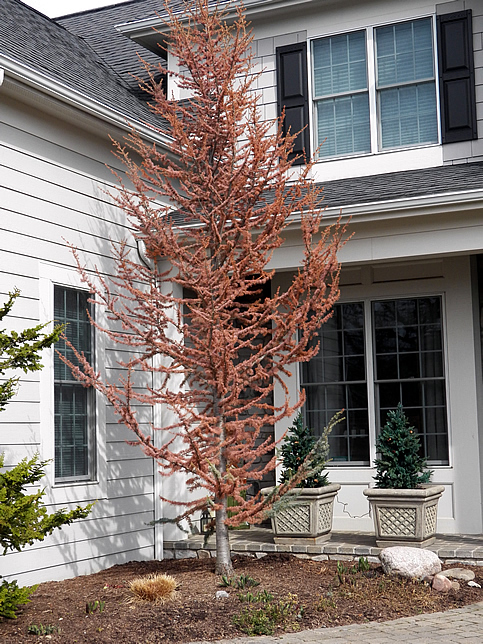 It is a very comprehensive overview regarding the type of landscape damage that you might find due to severe cold weather conditions. This image demonstrates damage found on plants around the pond at the nursery in March 2015. 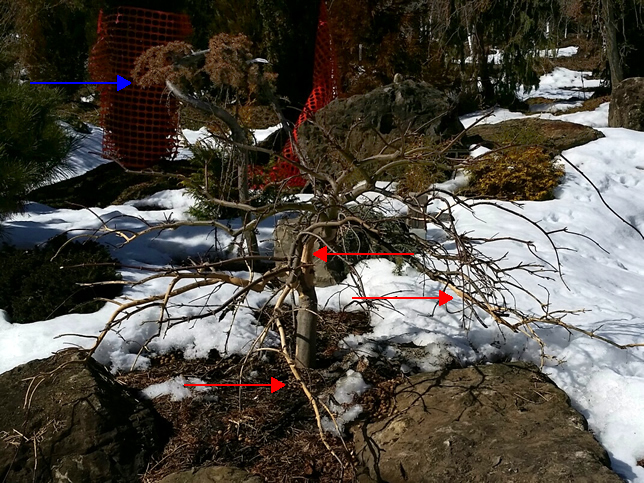 The severe cold turned the Blue Atlas Cedar brown (blue arrow), and the rabbits had a wild time munching on the Japanese maple (red arrows). 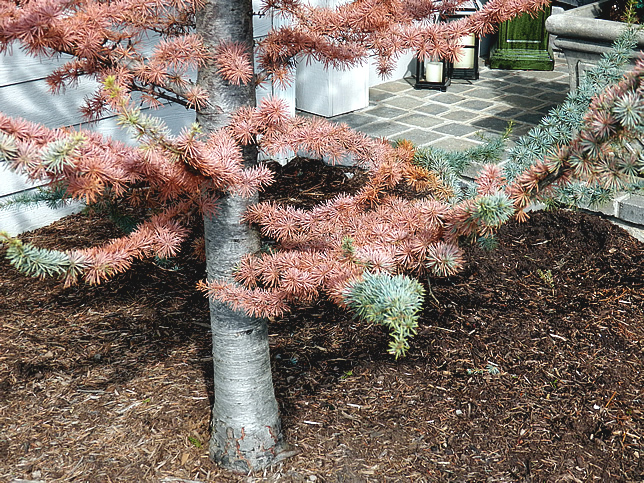 Here are some more images of winter burn on a Cedrus atlantica 'Glauca' this year. 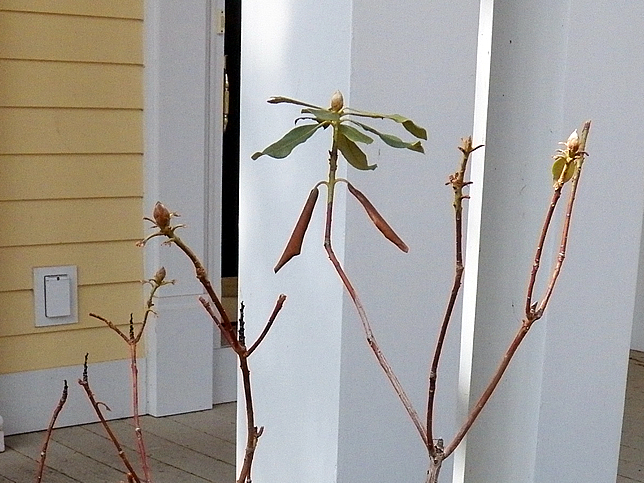 This plant is at the lower end of its hardiness zone (6,9) in our area, but this 2015 winter was brutal for it. Since the upper branches are still pliable, and there are undamaged needles on the lower branches that were under the 2.5-3' snowfall, we are waiting to see if it will push the brown needles off and recover. 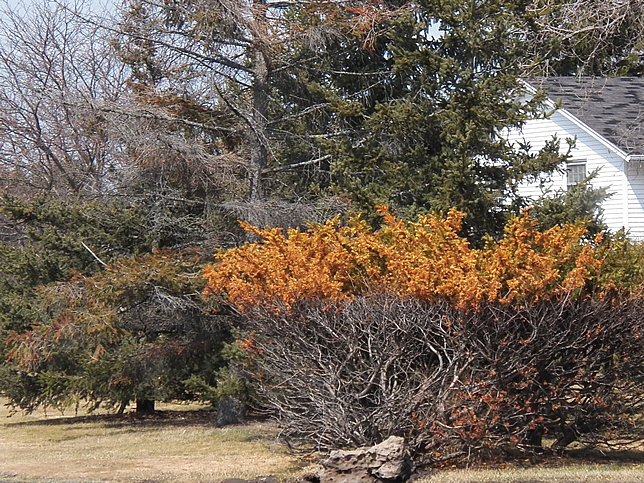 This poor yew shrub is a 3-way disaster! Sited at a busy crossroads with a southern exposure, it has suffered from road salt damage and siginificant deer damage over the years, and now, the final blow, winter burn. It will need to be removed. The deer were munching on everything, including spruces and junipers, which says that nothing is deer-resistant and every plant is fair game if the conditions are right and they are hungry. Rhododendrons are NOT known for deer resistance or tolerance, but this poor rhododendron had not been bothered for seven years. Practically all the leaves above the snow cover were eaten off this winter. The lower leaves and buds were fine. Cutting back the bare branches may force out new branching below.